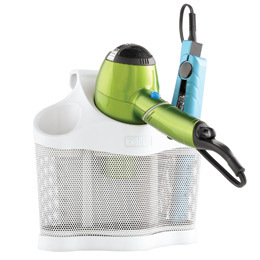 Recently I made a decision to purchase a hair dryer and curling item styling station from the Container Store. Now my bathroom counter top space is really clean and spacious. 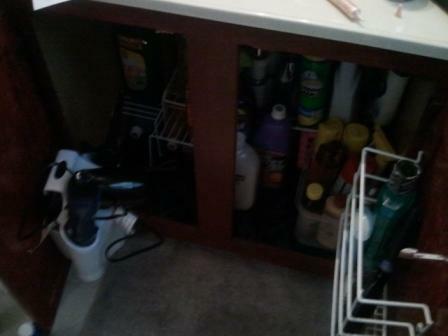 I also installed another storage unit on the other cabinet door to hold my mouthwash, deodorant, and hairbrush. In addition to that, I took the time to add some portable plastic shelves to hold my cleaning supplies under the cabinet. Now my bathroom counter and under the counter are super organized. You will only need a drill, tape measure, and screwdriver for this project. Is there any way to make your bathroom counter top more organized or spacious? Take a look and see. I hope I gave you some good ideas to start with. This entry was posted in Residential Organizing and tagged Bathroom Organizing, DIY, Products. Bookmark the permalink.